Mobile phones remain vital for reaching the masses in the Middle East (as discussed in a previous post), but what’s less clear is what to do once you have them on the line. As mobile penetration rates continue to climb, the next challenge will be training and organizing networks to crowdsource shared problems. On Sunday, August 21, TechChange and Souktel held a training in Ramallah to explore how applying tools for mass SMS and crowdmapping could play a role in community organizing and crisis response. The training consisted of three modules: 1) Simulation of directing ambulances through checkpoints after a major attack; 2) Creating a new Ushahidi map and thinking strategically about its application; and 3) Registration for the Standby Task Force. Having played with our deployment (which is still active at checkpointstatus.org – NOTE: for training purposes only) for a while, it was time for participants to create their own. Ushahidi provides a user-friendly option at crowdmap.com, where participants were up and running making maps in minutes. However, before getting started, participants were challenged to answer the following questions: 1) Issue (what’s being mapped? ); 2) Crowd (bounded or unbounded? ); 3) Tools (SMS, Twitter, email? ); 4) Analysis (verification and interpretation? ); 5) Action/Response (if applicable); and 6) Monitoring and Evaluation (how do you know you’ve been successful?). Even though our simulation had dealt with issues of life and death, participants were shown other deployments and encouraged to think broadly about the types of challenges they could address. The most popular deployments? 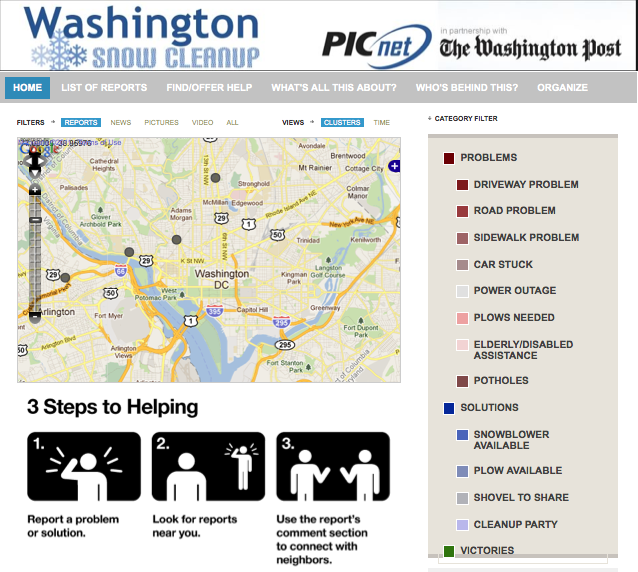 BurgerMap, which maps the world’s best burgers, and SnowmageddonCleanup, which helped Washington, DC residents dig out from heavy snow in February 2010. Although focused on logistics, the SnowmageddonCleanup deployment was popular because it didn’t only crowdsource problems (e.g. Car Stuck) but also possible solutions (e.g. Shovel to Share) that didn’t require coordination with the already overwhelmed authorities. Citizens could map and solve the problems themselves. The meeting concluded with a brief overview of the Standby Task Force, an online volunteer community for live mapping. Although mappers could be drawn from all over the world to help in the event of a crisis, it’s the those already on the ground who are often the first responders and can serve as the local tip of the international spear. It’s not inconceivable that a network of ten thousand crisis mappers can all need to go through one local expert for data verification. Ramallah is ready. Is your community? Christopher Neu is the Director for Middle East Programs at TechChange.